It was a full house for Huw Williams, and rightly so. The man is a brilliant songwriter, champion Eisteddfod clog-dancer, adventurous guitarist, bizarre storyteller, Welsh bagpiper, manager of Cool Cymru ambassadors Calan and erstwhile half of a duo with Tony Williams, who conquered the folk clubs and concerts of Britain before they decided to ‘retire’. Huw dropped out of the folk-club scene for a long time; however, he was a vital member of the Welsh supergroup Crasdant for many years, and he maintained his prominent profile by tutoring and teaching clog-dancing at trac workshops. He took the decision to return as a solo artist, and now he is a sought-after and highly-respected musician who can hold the audiences of both folk clubs and festivals spellbound and smiling. 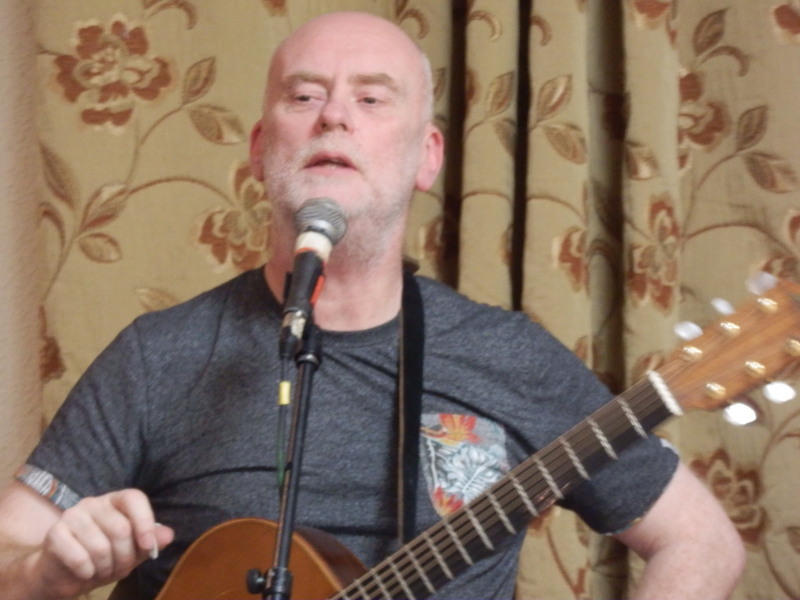 Huw tells his fascinating and funny story of how an unemployed Brynmawr teenager became a prominent songwriter, with famous folk artists such as Fairport Convention and Calan queuing up to learn his material. His patter is that it was just pure luck that got his songs noticed; but his highly-original and utterly mesmerising repertoire spoke much more than that. He waded in and hooked the audience with the Huw and Tony favourites ‘The Flanders March’ and ‘People Of The Heavens’; you could hear the crowd singing those old familiar songs in harmony. But Huw’s compositions do not date, and he inspires and enchants the folk world by writing new material to this day. The punters must have heard the songs time and time again, but there are still new delights to discover and savour. Calan have recorded his latest penning, ‘Giggly’, and he polished up and delivered ‘Giggly’ and stamped it with his own special style. Geoff Cripps has worked hard and long in promoting folk in Wales, but the public does not give him the recognition he deserves; however, Huw made sure of that when he saluted Geoff for recording the first Huw and Tony album and the follow-up for his fledgling Steam Pie label. The reason he became Calan’s manager was his daughter Bethan, who plays exciting accordion, sings lead vocal and clog-dances for the band; Huw threw in a gorgeous little number showing his love for this little child, soon to blossom into a grown woman and a cracking musician. He even added a clog-dance in his inimitable style, the old North Wales ceremonial dance ‘Cadi Ha’ to his own unaccompanied singing. The audience stayed on to Huw’s final set, which was a measure of his well-crafted and finely-honed songs, each one an absolute belter. Many songwriters could take a lesson from his brilliant chord progressions and his thoughtful and entertaining lyrics, but his magic touch just about seals it and cajoles the listening public to come back for more – and more and more.